Ok, so its not the MOST luxurious car on the market. It is, however, luxurious enough -- at least for me. Price was a comfortable reach, and the cost to own is proving to be a very wise investment. My first hybrid, and I'm very satisfied with my choice to buy Lincoln. 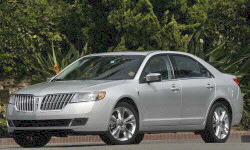 Why the 2012 Lincoln MKZ? Reminds me of old fashioned American luxury. Drives like a big car, but will handle with a sporty nature if summoned. I have been averaging 37.8 combined mpg in warmer months, and averaging 35.2 combined mpg in colder months. I do have to drive with a light foot to achieve these numbers. I love driving in luxury, and this car delivers much of it. From the cooled/heated seats to the delicious feel of the leather seating surfaces, this car offers more than adequate comfort...and it is a luxury automobile after all. I would expect no less from Lincoln. The Hybrid system operates flawlessly. Silently it changes to all electric, to electric combined with gas, to all gasoline power, to what seems like endless variations of everything in between. Most changes are not noticed, and the few that are--can hardly be detected. The whole experience seems very refined. Smooth as butter with the CVT transmission, and if you try real hard, you can feel a bit of that old fashioned Lincoln big car ride peeking through. Why Not the 2012 Lincoln MKZ? There is not much to dislike about my MKZ hybrid. The trunk is a bit small, due to the hybrid battery placement. And there isn't a 60/40 rear seat option available. The 2012 MKZ hybrid offers respectable luxury, at an affordable price, while delivering an inviting ride. The beautiful Bordeux Reserve color has an intoxicating effect against the inside light camel leather seating. Its class...American style.